Put the honey, sugar, water and cream of tartar into a saucepan, bring slowly to the boil, and cook gently until a temperature of 260°F, is reached. Have ready the stiffly beaten egg whites, and pour the boiling syrup slowly onto them, beating vigorously. Add the vanilla essence and desiccated coconut. Beat until thick and creamy, pour into a greased pan and leavy overnight. 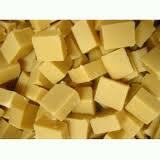 The next day, cut into squares, and leave in the air for a day or two, until firm and dry.